Product prices and availability are accurate as of 2019-04-06 14:59:16 EDT and are subject to change. Any price and availability information displayed on http://www.amazon.com/ at the time of purchase will apply to the purchase of this product. 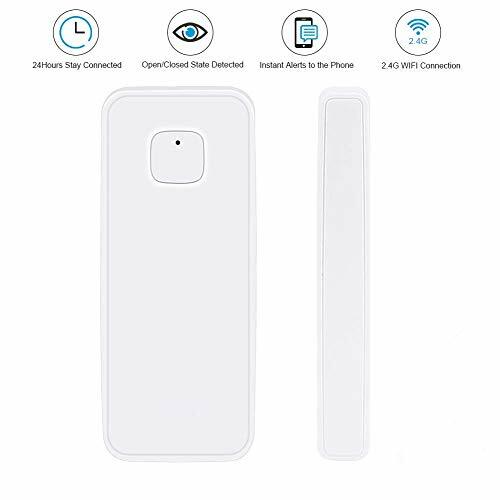 NPL Door Window Sensor, provides a simple way to monitor critical points of your house or office, such as side door, window, garage, safe, cabinet and more. It connect to 2.4G WiFi directly, no HUB requited, easy to set up Your own security System. Get an instance alert when door or window is Opened, Closed or Tampered by your Android/ Apple phone at anywhere. 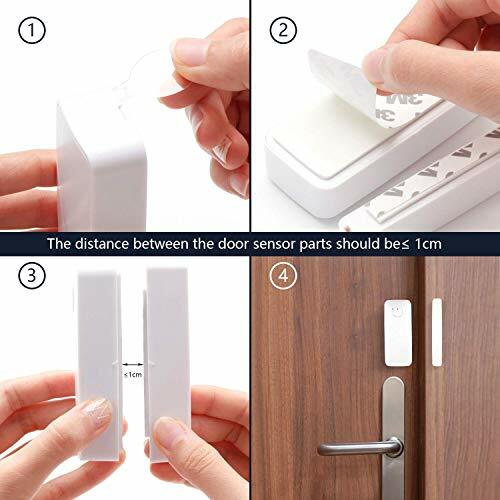 How to install the door sensor? 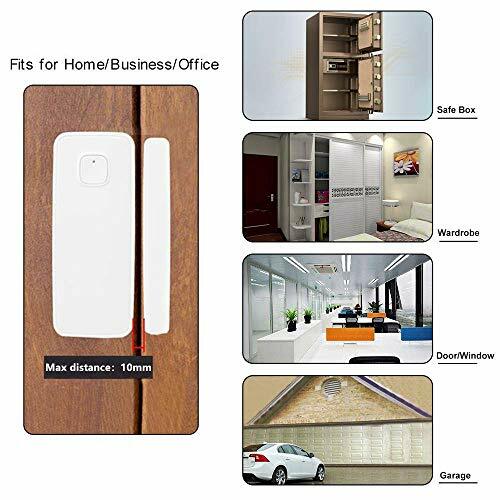 Small in volume with fashionable and wireless design, can be fixed on anywhere by either 3M tape or screw easily. The sensor body and magnet part have to be installed within 10mm when door/window is closed. The sensor body and magnet part have to be installed within 10mm when door/window is closed. This sensor should not be mounted directly on or near metal framing or other large metallic object. Only be placed indoor and away from water and other extreme weather conditions. If you are experiencing a situation where the mobile app cannot receive push notifications, don't worry, it is our system upgrade and maintenance, there will be 12-48 hour push pause. The message record in the mobile app can query the record of the switch. For the sake of server security and stability, we will maintain and update the server from time to time. 1. Made sure the wifi door sensor & your smart phone are in same 2.4G WiFi environment when first time pairing. 2. Download the APP named as “Smart Life" Connect” from Apple Store or Google Play. 3. Start APP and register an account with your email address. Login APP with your account and press the “+” Upper right corner, then press”ALL”,chose the”Wall Switch”, (read “how to make indicator rapidly blink”). 4.Power on the Sensor and hold the button in front for 5 senonds, then you will find the light rapidly flashing. Next enter the wifi password. The sensor will connect in a while. ?Enjoy the smart life of the future?when you go away, It will push notification message to your phone when the door/window opens and closes, so you can discover the intruder in time. Furthermore, you could share the smart sensor to your familes and track the history of sensor activities. 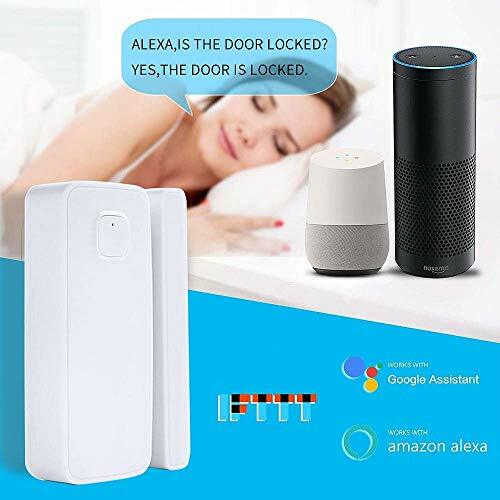 ?Compatible with Alexa & Google home & ifttt?simply use your voice to control the connected devices by Amazon echo or Google home. 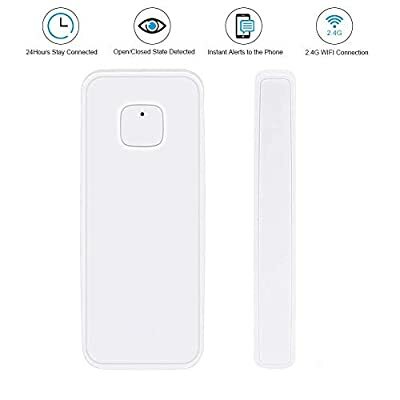 Convenient for you to detect your doors, windows, garage, cabinets, drawers or anywhere you want to notified when it is opened or closed. ?Easy installation complicated installation tools are required. 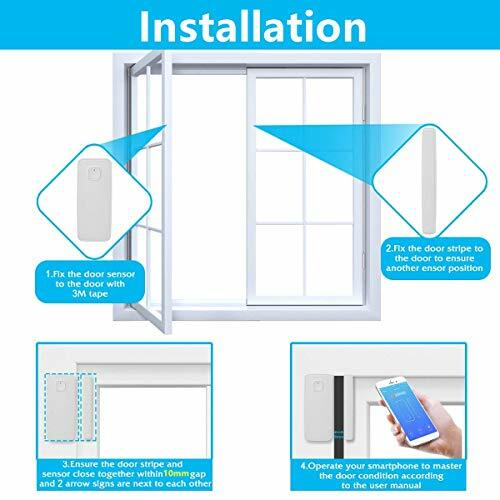 The sensor can be installed with double-sided adhesive tape or screws(included) in just a few steps, and download an app "smart life"from Google Play or app store to add the device to detect the status of your door/window. 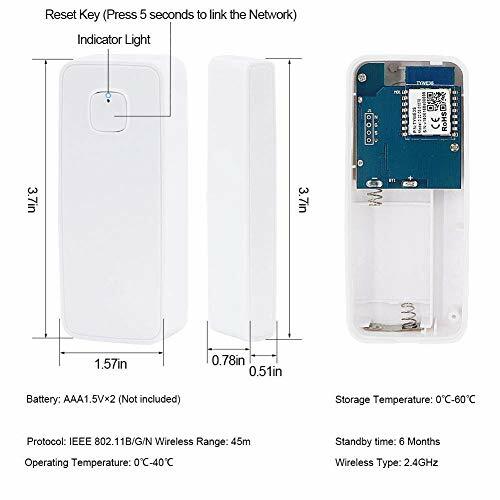 (Notice the image left side) ?Please note?this smart sensor only works with 2.4G Hz Wi-Fi router. Wide gap performance allow for up to 1 cm when door/window is closed. The smart sensor works with 2xAAA battery and it can work continuously for 6 months (batteries not included). please Read connecting steps on image or the instruction manual which in the package first before the smart sensor was installed. ?Use voice?supported voice command is as below to get the state of the "front door": Alexa, is the front door locked? --Alexa will respond: Yes, the front door is locked/or no. Ok goole, is the front door on?--Ok goole, is the front door off?--Ok goole, is the front door on or off?